The 2018-2019 season will be kicked off at the CITA League Meeting Wednesday, June 27th at 10:00 in the Five Seasons Board Room. Libertyville has two teams in the Girls High School league. The Libertyville 1 team made it to the finals against RC Lake Bluff. Both teams have a solid group of players who have had some good wins during the season. With only 3 matches, every match counts. Libertville won on courts 1 and 3 and RC Lake Bluff won on court 2. Libertyville 1 won the League Championship. Nice playing everyone. Once the Men’s 4.5 matches were done, some of the players from the 4.5 teams moved over to their Open teams. RC Lake Bluff and College Park were going to see who had more fire power and finesse. Would the players who just played in the 4.5s still have enough energy to play up to the level demanded of them? On court 4, clearly Peter Krizman and Steve Paulson (RCLB), still had enough in the tank because they were the 1st to come off the court, after playing court 3 in their 4.5 match. 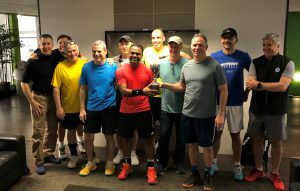 They played agains Trevor Desilva and John Metzger, who also played in the 4.5s with different partners. Court 2 came off next with Josh Leighton and Josh Graves (CPAC) pulling out a close win against Jordan Verbauwhedeand Peter Morawiecki. Matches tied 1-1. Court 1 came off next 6-4, 7-5 to RCLB which left court 3, which RCLB won in 3 sets in a tie-breaker. This is RC Lake Bluffs 2nd win in a row. Congratulations to both team for stellar play, nerves of steel and a competitive spirit. 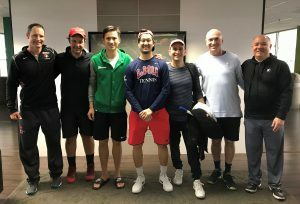 This year the Men’s 4.5 and Men’s Open teams were from the same clubs. 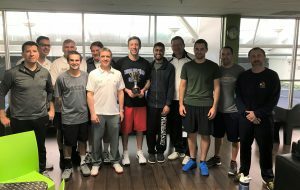 The Racquet Club of Lake Bluff (RCLB) and College Park East (CPAC-E) both had players playing in both finals. Would those players have enough in the tank to play a 2nd match, both physically and mentally? One could only hope. RCLB didn’t have it easy on court 1. They won in 3. But on courts 3, 5 and 6, RCLB won in 2 sets. CPAC-E secured a win on court 2 and because RCLB had already secured a 4-1 win, court 4 was called with CPAC leading 4-2 in the 3rd set. College Park made a valient effort, coming close…but it’s some of those deuce games that can make a difference in the outcome. RC Lake Bluff won, taking the trophy back from the defending champions, College Park. 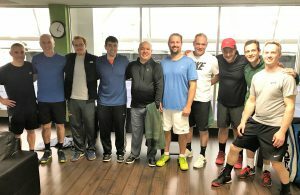 As soon as the Men’s 3.5 matches came off the courts, the Men’s 4.0 teams from Libertyville (LIB) and Midtown-Palatine (MTP) moved on to the courts. 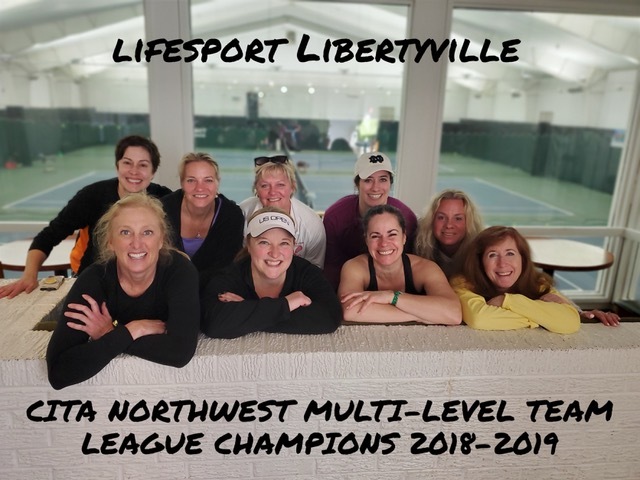 The Libertyville team, seeing their Men’s 3.5 team lose, steeled their nerves to create a different outcome. Courts 1 and 6 were done in 2 sets with LIB winning court 1 and MTP winning court 6. All the other matches were heading towards 3 sets. One by one they came off the court. The last match left was court 4. Libertyville was ahead 3-2 in matches, but if Midtown-Palatine won this match, that would mean matches tied, sets tied, time to count games. No one was quite sure that the set scores were for court 4. Everyone knew it was close. All they knew is that with all the other match games counted, LIB had 57 games and MTP had 55 games. Upon counting court 4’s sets 1 and 2, LIB was ahead by only one game. Everyone crowded around court 4’s viewing area. It was 4-4. Liberyville won their serve – 5-4. Midtown-Palatine’s turn. At 15-40, they had match points against them. They squeaked out another point to make it 30-40, but a missed shot gave Libertyville the win and the Championship! Way to give it your all!!! All of the Men’s Playoff matches were played out of College Park’s West location inside the Marriott Lincolnshire. The Men’s 3.5 matches started at 10 AM with Libertyville and Midtown-Bannockburn ready to play. In 2016, Midtown-Bannockburn (MTB) came close to making it to the finals, only to be defeated by River Trails by 2 games. This year it was all MTB…but not without some concern (yes, Todd Seltzer, I heard you were pacing the floor). MTB won court 2 in 2 sets, then court 4 in 3 sets, so they were feeling pretty good about their chances. Court 1 was a close match with MTB winning 6-4, 6-4 securing the Championship. And court 4 decided their match with a 3rd set match tie-breaker which MTB won 12-10. 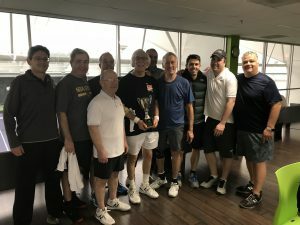 Congratulations to Midtown-Bannockburn for their first time win in the Men’s 3.5s! 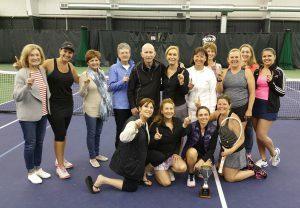 Northbrook’s NC Women’s Open team took home the trophy for the 2nd year in a row! While the match scores reflect a 6-0 win over North Shore 2 (Jerry’s team), scores don’t always reflect the full story. I know everyone played their hearts out and win or lose, we came off the courts respecting our opponents game. 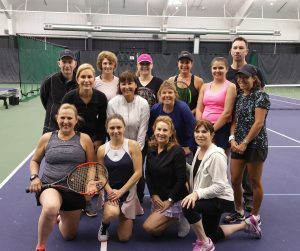 Lakeshore and Glenbrook faced off against each other at Glenbrook Racquet Club. Both teams have a fairly strong group of players who know what it takes to win. Lakeshore took home wins on courts 2, 3, 4 and 6 with three of the four matches won in 3 sets. Glenbrook won on courts 1 and 5 in two sets. If any of the 3 set matches had gone Glenbrook’s way, GRC would have won in sets which is why it’s important to close out in two. All the matches were close. And while Glenbrook had home court advantage, Lakeshore kept their eyes on the prize and went back home with the win. Congratulations to both teams on a good season of play. 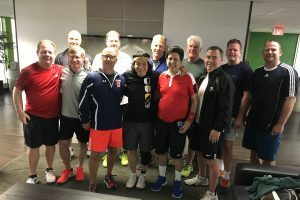 Midtown-Chicago and North Shore played their NCW4.5 Green final at Five Seasons with MTC stepping on the courts with a one court advantage as NSRC had to default one court. 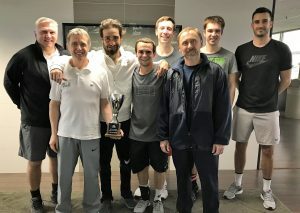 Midtown-Chicago dominated this league during the regular season and while North Shore did their best counter MTC’s firepower, all 6 courts were won by MTC. Get a Cardio workout – keep your feet moving! For more information on our leagues, call Jennifer Perry (847) 814-2148. As a reminder: Please contact the individual clubs to determine if Child Care Services are available at that club. You can all be willing participants in the quest to reduce your environmental footprint by bringing your worn out athletic shoes to the clubs who are participating in Nike’s Reuse-A-Shoe program. 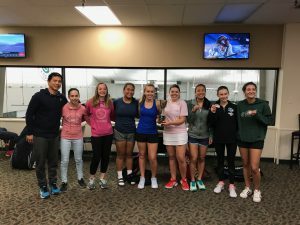 College Park Athletic Club, Five Seasons Family Sports Club, Glenbrook Racquet Club, North Shore Racquet Club and Northbrook Racquet Club have made the commitment to collect shoes throughout the year. Once collected, shoes that are gently used are separated and given to Share Your Soles, a not-for-profit organization (http://shareyoursoles.org/) and the rest are sent to Nike’s facility in Tennessee where they are shredded and turned in to “Regrind”, which is then used for playgrounds and sports courts. Be green and bring your shoes in to the clubs mentioned above. Then go buy another pair of shoes from them!